Alex Chilton, Jody Stephens, Chris Bell and Andy Hummel in BIG STAR: NOTHING CAN HURT ME, a Magnolia Pictures release. 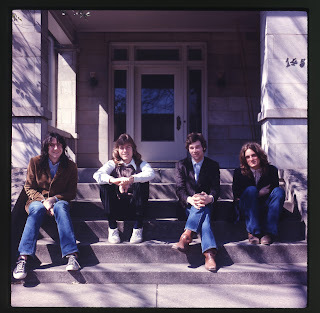 Big Star: Nothing Can Hurt Me tells the story of a great band that didn’t originally make it: Big Star. When Big Star’s music was originally released in the 1970s, their work was critically acclaimed and they seemed destined for great fame. However, the band had some terrible strokes of luck and was simply not destined to be a success. A short time later though, Big Star gained popularity due to their influence on many popular bands such as R.E.M. All three of Big Star’s original albums are included on Rolling Stone’s list of the top 500 albums of all time. The film tells the entire Big Star story from beginning to end and it is one that is as triumphant as it is tragic. This film, while not the best documentary I’ve ever seen, is incredibly important to see because it will introduce scores of people to a band that they may never have heard of otherwise. This band’s is actually really powerful and I am thrilled to know about them now thanks to this movie. Big Star needs recognition. They should have had it decades ago, but didn’t get it. Big Star tells a fascinating story tinged with sadness. Directors Drew DeNicola and Olivia Mori are not afraid to look straight into the darker aspects of the Big Star story, and this helps the movie a lot. This is not a sugarcoated success story. This is a story that ends in success but takes a lot of pain to get there. Big Star: Nothing Can Hurt Me, at 113 minutes, is on the longer side for a documentary, but is fast-paced and never boring. There is so much information poured into this documentary that it never runs out of stories to tell. This is one of its flaws too. There is so much information in the documentary and so many years to cover that I never felt as if went in depth enough (the stories are really interesting, but there should have been more even though the running time would have been huge). Some of this was out of the filmmaker’s control, though, as many of Big Star’s members are dead. However, there are ways to get around that. One other issue I had with Big Star: Nothing Can Hurt Me is that it was not as emotionally engaging or rousing as I would have hoped. While not a particularly happy story, I would have liked to see a bit more energy put into the movie. I also was not as emotionally engaged as I would have liked. The film takes a very story-based, not character-based, approach to the Big Star story. While this may have been more practical, I would have liked to get to know some of the band members better to form an emotional connection to the movie. That being said, I was emotionally satisfied by the final part of the film. Overall, Big Star: Nothing Can Hurt Me is a solid documentary that I would recommend seeing. While certainly not groundbreaking, it tells a very important story that needs to be told. Had I not seen this movie, I would have never heard of Big Star.